A new Welsh law making fire sprinklers compulsory in homes will lead to fewer being built, the head of a construction firm has warned. The Welsh Government is consulting on the rules and says there is no timetable set for introducing water systems. But Steve Morgan, chairman and founder of Redrow Homes, says the costs will deter developers. He said that poorer areas - the valleys and the north east - would be hit. Mr Morgan told BBC Wales that the Flintshire-based company, one of the UK's biggest developers, estimates the cost of installing a sprinkler in a three-bed house to be about £3,500. He said that when that cost is added to the figure for proposed new environmental regulations on energy efficiency that the Welsh Government plans - once powers over building regulations are devolved - his company is having to move out of areas where it has traditionally built. "In areas where house prices are not that high, and I'm talking about areas where we build now, such as in the south Wales valleys, we can't even look at the valleys any more," he said. Mr Morgan said there were "unintended consequences" for the new regulations being brought in under the Welsh Government's new law-making powers. "What will happen is that the poorer areas of Wales will see no new development, the very places that need it the most will see no new development," he added. Last year a report from Cambridge University, commissioned by the Welsh Government, found that more than 280,000 new homes are needed in Wales over the next 20 years. That is around 14,000 a year, but only 5,500 were built last year and the rate has been falling annually since 2007. The House Builders Federation, which represents developers, estimated the cost of the sprinkler system at around £5,000 for a three bed house, but others think it will be lower. Ann Jones, AM for the Vale of Clwyd, has spent four years working to get the power to legislate on this devolved. She said the cost is more likely to be between £1,000 and £3,000, and that builders will be able to absorb costs and make other adjustments to off-set the sprinkler installation costs. "Homes are one of the biggest investments people will make and we have a duty to make sure people are safe," she told BBC Radio Wales, adding that the cost was a lot less than having to rebuild a house damaged by a fire. "I'm proud Wales has led the way in making people safe. Surely, that's what devolution is all about." 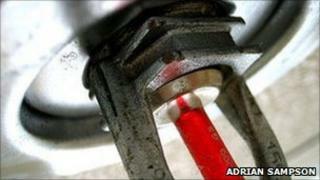 Steve Morgan said the sprinklers combined with any carbon reduction targets could push Wales into a housing "crisis". "The only areas that will be able to afford this extra burden will be the more expensive areas like the M4 corridor," he said. "My message to the Welsh Government is simple, do not put Wales at a total disadvantage to England," he added. The Welsh Government said it is waiting for a cost benefit report by the Building Research Establishment to be published. At the moment it has no timetable for bringing in new regulations, it added. On the environmental targets the government said it was aware of consequences for construction costs and will continue to consult with the house building industry over coming months.